 Log In needed $150 · Approx. 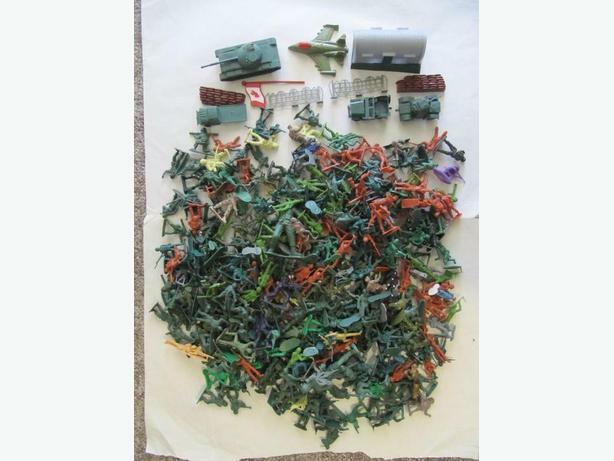 1000 Plastic Toy Soldiers, Military Vehicles, Cowboys, Indians, etc. They are various sizes and colours. The bulk of them are about 2" tall. All the photos give you a good idea of the different types and poses. There are obviously duplicates of pretty much all of them and in most cases many of each. There are approx. 800 Army soldiers, vehicles, etc., 25 cowboys and Indians, some fireman, a few astronauts and various other figures that can be seen in the photos although some are mixed in with one of the main photos. There are also the vehicles and accessories shown in two photos. The flat bed truck in the first photo is missing the back wheels. Some are damaged as in pieces broken off, usually weapons.